Product prices and availability are accurate as of 2019-04-17 20:49:31 UTC and are subject to change. Any price and availability information displayed on http://www.amazon.com/ at the time of purchase will apply to the purchase of this product. 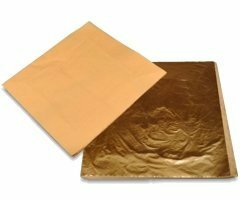 Imitation Gold Leaf Sheet Measures 5.5" x 5.5" (14cm x 14cm) 100 leaves can cover 21 square feet if done without overlap and waste. Composition gold is a mixture of 88% copper and 12% zinc. Looks and feels like genuine gold leaf. Each leaf has a tissue paper in between. (LOOSE TYPE) FRAGILE!!!!! 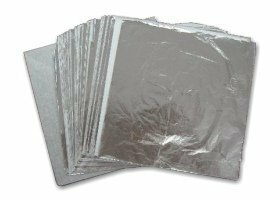 Imitation Silver Leaf Sheet Measures 5.5" x 5.5" (14cm x 14cm) 100 leaves can cover 21 square feet if done without waste or overlap. Imitation silver leaf is made by pure aluminum. Looks and feels like genuine silver leaf. Each leaf has a tissue paper in between. (LOOSE TYPE) FRAGILE!!! Genuine Copper Leaf sheet Measures 5.5" x 5.5" (14cm x 14cm) 100 leaves can cover 21 square feet if done without waste or overlap. 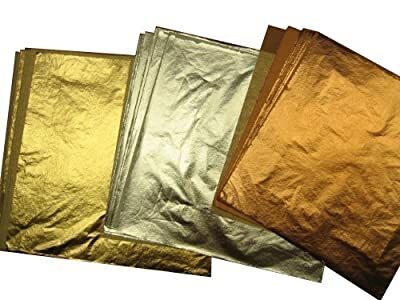 Genuine copper leaf is made by pure copper. (LOOSE TYPE FRAGILE!! !